There’s something about civilisation games, where you pit your wits against the computer and see who can create the mightiest empire, that strikes a chord with us. Up till now though, the two main choices for this type of game has been either the excellent Civilisation, which has great gameplay but not much in the way of immersive real time graphics, or Microsoft’s Age of Empires, both of which are commercial products which cost money. Not any more. 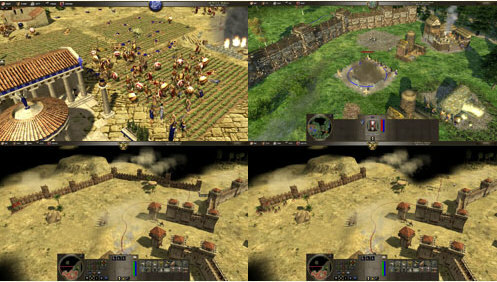 0 A.D. is a gorgeous looking real time strategy civilisation game which is based around the ancient worlds. The current alpha version (i.e. prepare for a few bugs) features Athens, Macedonia and Sparta and comes complete with the full range of fun activities like researching technologies, upgrading from villages to mighty cities and resource harvesting. And of course conquest! The level of detail is incredibly impressive for a free open source title (no offence to OSS games, we love them, but they sometimes tend to focus on gameplay to the detriment of graphics) and it’s clear that the developers really know what they’re doing. There’s also lots of cool little touches, like the instant wall building feature which takes the drag out of defensive construction. It’s a lovely product and a must-have download for fans of the genre.